The core of Rights & Democracy’s work is local organizing and electoral and legislative engagement. We feel a robust democracy requires people to become empowered to raise their voices on issues that affect them and their communities. We are committed to fighting for health care as a human right that should be guaranteed by our government. 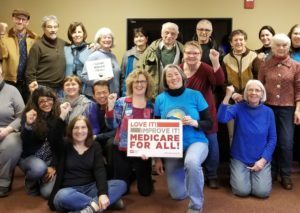 We rise up for a Medicare for All system that supports healthy people and communities, not the profits of drug and insurance corporations. And we fight for a health care system that guarantees care for all; at the time we need it, regardless of where we live or who we are. We are working to move toward an economy based on renewable energy that provides work with dignity and puts us on the forefront in the fight against climate change. We must advance a more unifying vision of how we put people and the planet over profit – and one that seeks to engage people around the idea of clean water, clean air, clean food, and clean soils. From business development to energy policies, including those focused on public transit, progress will be measured by an open, democratic approach to determining our future. We are part of a statewide movement to address our unequal school funding system. Too many public schools are struggling to keep teachers, or even prevent their schools from closing. We need to overhaul our funding system so that ALL children in New Hampshire, no matter where they live, receive a high quality education.